The Sled Dog Diaries has raised more than $3,000 to support northern veterinary clinics. Photo by Myrna MacDonald. A Saskatoon group called Happy Leopard Chapbooks has found a unique way to raise money for a cause close to their hearts while having fun at the same time. The group’s latest chapbook, The Sled Dog Diaries, has raised over $3,000 that will help support the Western College of Veterinary Medicine’s (WCVM) biannual remote veterinary clinics in La Ronge, Sask. The WCVM works in partnership with community representatives and members of the Northern Animal Rescue (NAR) to offer spay-neuter and wellness clinics for the northern Saskatchewan communities of La Ronge, Air Ronge and the Lac La Ronge Indian Band. 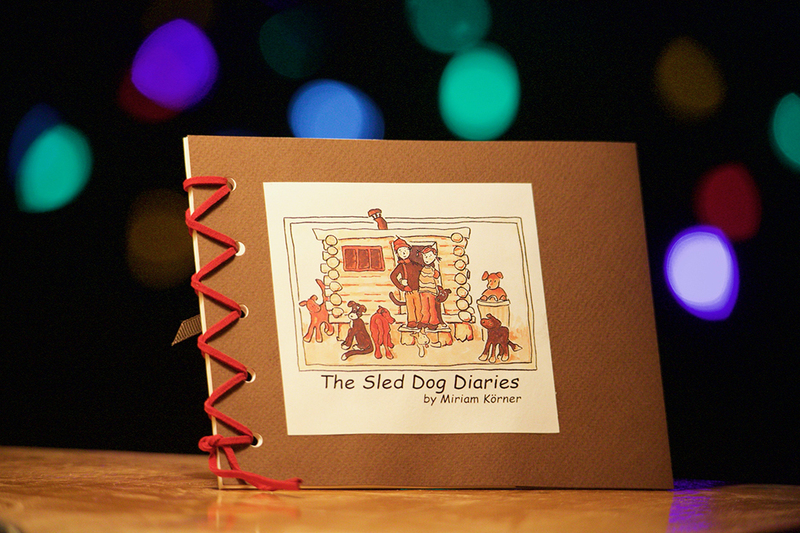 The Sled Dog Diaries was written and illustrated by Miriam Körner, a photographer, writer and illustrator who operates a dog sled company in La Ronge. Matheson says it seemed a perfect fit to donate the proceeds from the sale of the book’s 150 copies to the WCVM’s service learning program. When Dr. Jordan Woodsworth heard about the unique fundraising project, she was thrilled — especially since Körner has been a regular client and supporter of the northern clinics. “This is the first time an organization such as this has offered to spearhead a fundraiser on our behalf,” says Wordsworth, a clinical associate in wellness at the WCVM who’s responsible for the college’s service learning program. Since 2014, fourth-year veterinary students at the WCVM have had the opportunity to enrol in a two-week clinical rotation that includes a weekend spay neuter and wellness clinic in La Ronge. The elective rotation is limited to eight students and is offered twice a year. While the two-week rotation gives the students a chance to prepare for the high-volume clinic by refreshing their memories on anesthesia, surgery and wellness care, it also includes training about Indigenous history and culture. Woodsworth and WCVM clinical associate Dr. Karen Sheehan oversee the clinics and organize food and lodging for the large number of volunteers from the WCVM and from private veterinary practices throughout Saskatchewan. These volunteers are accompanied by trailers full of medications, supplies and specialized equipment. While the program’s start-up costs were covered by grants from the University of Saskatchewan (U of S) and the WCVM, its general operating budget relies on funds from the university and the veterinary college as well as donations of products and money from industry partners and organizations such as Veterinarians Without Borders Canada/Vétérinaires sans frontières. “Donations big or small are welcome, and we’re always looking for people who might be interested in supporting this program,” says Woodsworth. Matheson, along with Kate Hodgson and Murray Wood, founded Happy Leopard Chapbooks in 2008 after their involvement in a project that created and sold a limited-edition book to raise funds for Saskatoon’s Station 20 West. Since then Matheson and Hodgson, who are both proficient at book making and illustrating, have worked on a number of projects and donated thousands of dollars to local charities. Woodsworth emphasizes that donations such as theirs help to make the clinics accessible to everyone – and that’s a major goal of the service learning program. She also appreciates the work of the Lac La Ronge Indian Band and NAR representatives who promote the clinics and support local pet owners. Organizers charge a fee for the remote clinics’ veterinary services but also offer subsidies and reduced costs for services. “The more support we have, the more people we can bring in to help run the clinics, so the more animals we can see and the more we’re able to offer those subsidized services,” says Woodsworth. She particularly enjoys “seeing the lightbulbs go on” for the students as they realize how important the clinics are to the northern communities. She’s hopeful that this experience will influence them to participate in similar events once they’ve begun their veterinary career. Woodsworth appreciates that the members of three communities are working together to address animal welfare and population and health management, and she values the champions in the community who have worked toward better bylaws for animal control and pet licensure. She reiterates that this project’s success depends on support from industry partners and groups like Happy Leopard Chapbooks as well as the community’s year-round efforts.